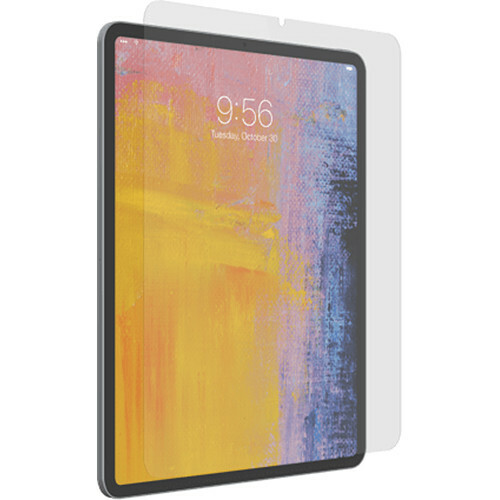 Protect the display of your Apple iPad Pro from scratches, chips, and cracks with the InvisibleShield Glass+ Screen Protector for 12.9" Apple iPad Pro from ZAGG. Designed to fit the 2018 version of the 12.9" iPad Pro, the InvisibleShield Glass+ Screen Protector features Ion Matrix technology, which offers impact and shatter protection. Reinforced edges help prevent chips and cracks, while the protector's tempered glass is designed for maximum clarity and sensitivity to touch input. EZ Apply technology helps to ensure simple and bubble-free installation. Glass+ features Ion Matrix technology, which offers impact and shatter protection. A precision surface finishing process that is designed to provide maximum scratch resistance. Strengthened beveled edges help prevent chips and cracks for a smoother, seamless touch. Smooth tempered glass with reinforced beveled edges are designed to provide maximum image clarity and precision touch sensitivity. Helps to ensure fast, accurate, and bubble-free installation. Box Dimensions (LxWxH) 16.1 x 10.4 x 2.1"